I guess different people will place different emphasis on these words. I was born in the British colony of Barbados but I grew up in an independent nation. I sang our national anthem almost every school day and certainly recited our national pledge. I was indoctrinated, so to speak. As an adult I joined the Rotary Club of Barbados and we proudly sang the national anthem every week. Does our Town Planning policy focus on what must be done to preserve the land for generations to come? Are the current developments charting a positive direction for our future? Will we be proud to see our actions written on history’s page? I fear that the answers to these questions in relation to real estate development may not always be ones that we can be proud of. I am particularly discouraged by the decline in the agriculture industry, which was the backbone of our country. Indeed the fortunate position that this country found itself in going into independence was created by the spoils of a profitable sugar industry. In 1966 when we became an independent nation our population was reported to be 236,000. Today in our 50th year of independence the population is estimated to be 291,000 representing growth of 24% over the period. On the other hand in 1966 it was reported that 61,000 acres of land were in active agriculture production. Today the estimate of the amount of land designated as agriculture but perhaps not in active cultivation is 32,000 acres – a drop of nearly 50% but more likely higher when all the abandoned fields are subtracted. Some of the land that is no longer in agriculture has been converted to residential use for housing. As our nation prospered more people could afford their own home or investment property and in fact the number of households grew by 40% between 1990 and 2016 alone. We were unable to find data predating 1990. So while the population grew at half this rate our prosperity allowed a much greater expansion in the housing stock. One statistic that I find remarkable is the life expectancy change over the period. When I was born in 1964 and through to 1966 the average life expectancy for a Barbadian was only 63 years of age. Today the life expectancy is 78 – a huge change that is not only attributable to global health care standards but also to the dedication of the health care professionals who have improved the services in Barbados. Our prosperity has allowed for better nutrition, anti-natal care and of course health care itself. We are living longer and healthier lives. Our economy has been transformed over the period from agriculture dominated to off shore business services and tourism. In 1966 it is reported that our entire hotel room compliment was 1,053 while today the BHTA reports 5,264 rooms. 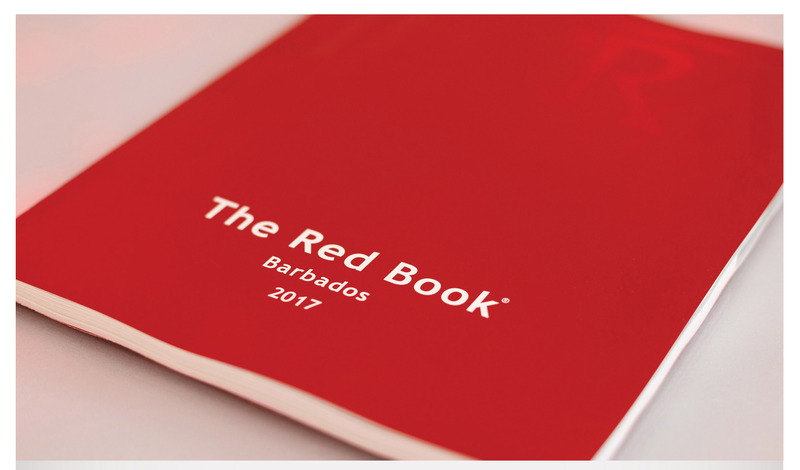 There has been renewed investment in this sector in the last 5 years with Marriott and Sandals both making investments but this comes on the back of a significant loss in hotel room stock in the previous decade. Planning policy certainly played its part in this decline by allowing the change of use of hotels to apartments and villas when the economic drivers dictated. The change in visitor arrivals was more dramatic moving from 22,000 in 1966 to 680,000 in 2016. The FX earned from this sector has certainly replaced many times over the earnings from the sugar industry but it has also come at a huge import cost meaning that not all the money spent here stays here. In 1966 middle income residential land lots averaged in size around 10,000 sf and the average sales price was $1 per square foot. Today similar developments offer lots in the 5,000 sf range at around $18 psf or just under $100,000. Real income growth over the period has not kept pace with the increase in the land prices and today it is harder for young middle income families to own their first home. From our perspective we have only anecdotal information to support this theory but what we do see is the extended family helping sons and daughters to purchase their first lot of land or house. As we have explained in previous articles we believe that the low population growth and the stagnating growth in real incomes coupled with the increase in supply of residential land will continue to depress land prices. This has been shown to be true in the actual decline in land values, which Hayden will explore in his article. 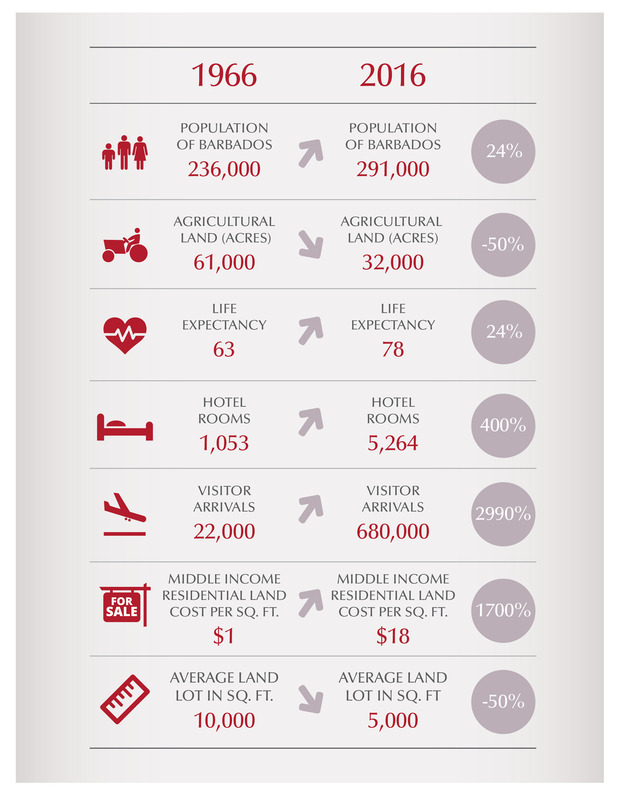 In looking a bit further forward we think that this trend will actually be good for Barbados in the long term. Today there is more land with change of use to residential than we need for the economic expansion. The remaining land that is suitable for agriculture needs to be strictly guarded as our anthem implies. That does not mean that there should be no further change of use of land but rather that what has already fallen out of agriculture should be utilized to its maximum potential. Each year it seems there is at least one real estate development proposed for the market that is the subject of debate in the public arena. This year that development seems to be the Hyatt Hotel and Residences proposed for Lower Bay Street, an area very much in need of gentrification. It has been interesting to hear the views of persons who are against a multi story hotel in this location or it would seem in any location. In my opinion Barbados needs this type of high-density development so that other lands can be preserved for other uses. We know we need the hotel room stock. If the hotel can only be a quarter of the height then it will need to be spread across 4 times the width to provide the same room stock expansion. This will still have the effect of blocking the view to the water but it will also have the effect of blocking the view and access from a much wider area. In my opinion the area known as Carlisle Bay should be reserved for these tall buildings and I believe that this would be consistent with the Physical Development Plan. I am yet to hear a credible reason as to why a 5 story building in this location would be better than a 20-story version. I hope the Hyatt receives permission and is successful. It could well be the long awaited catalyst for the redevelopment of Bridgetown.